Sarah McCulloch To Face Perjury Hearing In High Court. 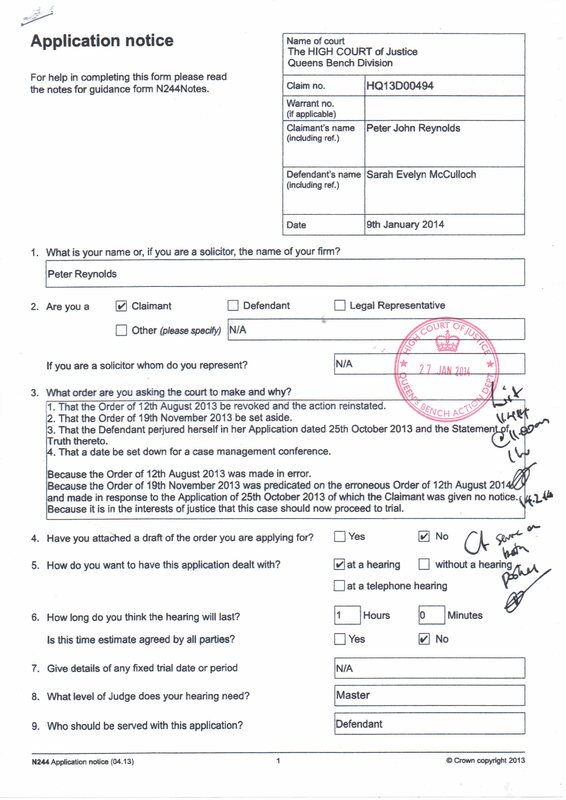 In October last year Sarah McCulloch submitted an application to the High Court seeking judgement against me on the grounds that I had “not acted on my claim”. This was untrue. Also, in a bizarre twist she revealed that she has twice reported me to the police for harassment for sending her correspondence about the case! These positions are clearly incompatible with each other. Dishonestly, she submitted her application and attended a hearing on 19th November 2014 without ever notifying me. She has now admitted this in writing saying that it was a “mistake”. A hearing will take place on 11th April 2014 at which I will apply to set aside the judgement that she has obtained on the grounds that she did so through deception and dishonesty. « Extraordinary Change Of Tone On Cannabis By The NHS. Well Darryl, if I had £50,000.00 to throw away, the services of counsel from 5RB and a firm of solicitors with all the style and ethics of spiv, wide boy, used car salesmen (see ‘Call Saul’, Breaking Bad) up against a litigant in person with no legal training, I’d feel pretty confident, especially if I could successfully evade any of the substantive issues being considered. However, I might have doubts if I discovered a direct access barrister, also from 5RB and more senior, had agreed to settle amended PoC which will result in the substantive issues being addressed. Yes, then I might not be so confident ;-). Well this is certainly compulsive viewing! Chris Bovey feels obliged to use lawyers as he is compelled to defend your actions, and the whole construct is designed to create a closed shop for law firms to cash in. Whilst it is a technical process about drawing lines from rules, it doesn’t seem patently absurd if the whole point of it (to seek a ruling based upon legal/equitable principles raised in a claim) is struck out for want of precise adherence to the rules, especially for a LIP. I realise that I am saying the opposite of what I meant above; where I say “it doesn’t” (with respect to the absurdity of not hearing any substantive issue), I meant to say ‘doesn’t it’ as a rhetorical question.